WINNER: Andrew C. Thomspon: Bob was determined not to miss one minute of the half-time show while waiting in line for the men's restroom. I see you found a picture of Tidy, Mascot for the St. John's Crappers. 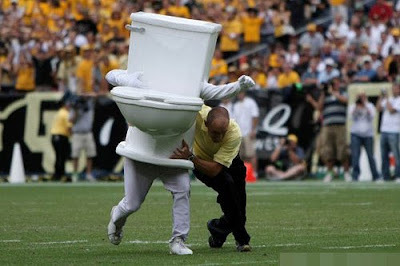 Bob was determined not to miss one minute of the half-time show while waiting in line for the men's restroom. Leaked picture from a undisclosed Secret Service training facility. "You want me to stop your toilet from running. No problem." The guys at Leo's Hardware take the words "Fantasy Football" a little too literally. The mascot for the freshly inaugurated Tidy Bowl. This is what they mean by the "runs?" "Toilet training is tough. That's why there's Huggies!" Now THAT'S hugging the toilet!